Hundreds of thousands of people marched in Barcelona on Sunday to protest the jailing of nine Catalan separatist leaders facing trial on “rebellion” charges. Many chanted “Freedom for the political prisoners” as they marched along the Parallel Avenue, one of the city’s main streets, many waving the red-and-yellow Catalan flag. The protest comes six months after the first incarcerations of top Catalan separatist leaders for misuse of public funds, sedition and rebellion — which carries a prison sentence of 30 years and implies that a “violent uprising” took place — over their separatist push. 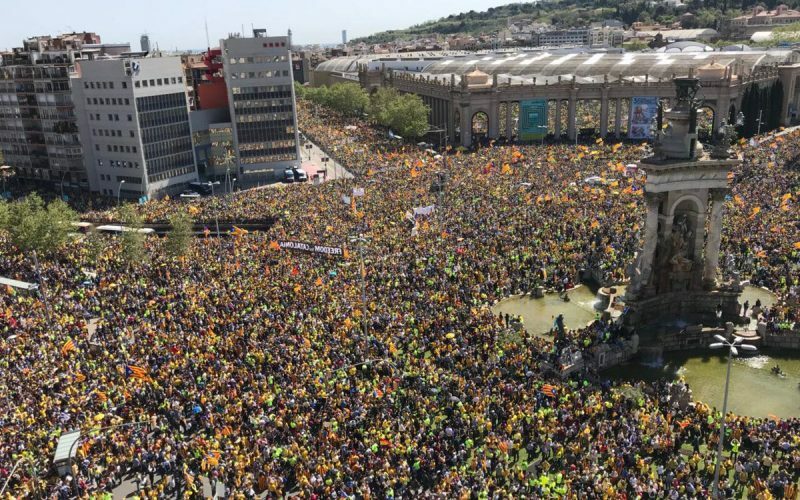 “Since they could not decapitate separatism, they are trying to do it through the courts,” Roser Urgelles, a 59-year-old teacher, told AFP at the protest. Like thousands of others at the march, she wore a yellow ribbon to show solidarity with the jailed leaders, whom Catalan separatists consider to be “political prisoners”. Spain’s justice minister, Rafael Catala, has called the use of yellow ribbons “insulting”, arguing that Spain has no political prisoners but “politicians in prison”. The Guardia Urbana, a Catalan municipal police force, said 315,000 people turned out. The demonstration was organised by two grassroots independence groups, the ANC and Omnium, whose presidents are among the nine separatist leaders in prison awaiting trial on their role in last year’s failed breakaway bid by Catalonia. The protest was backed by the Catalan branches of Spain’s two largest trade unions, the CCOO and the UGT, sparking unease among union members who oppose independence. “There have been tensions (among unions members) just like in the rest of the Catalan society,” the secretary general of the Catalan branch of UGT, Camil Ros, told AFP. The demonstration comes 10 days after a German court dismissed an extradition request for Catalonia’s ousted separatist president Carles Puigdemont on grounds of rebellion and released him on bail. Spanish prosecutors last week handed over new information to Germany they hope will prove the use of violence which would justify the rebellion charge against Puigdemont and their extradition request. Puigdemont is also accused of misuse of public funds for staging an independence referendum in Catalonia on October 1st even though the courts had ruled it unconstitutional. Since October 16th the leaders of Catalonia’s two largest pro-independence groups — Jordi Sanchez of the ANC and Jordi Cuixart of Omnium Jordi Cuixart — have been in jail while they await their trial for rebellion. Prosecutors say the two men played central roles in orchestrating pro-independence protests in September in Barcelona during which national police were trapped inside a government building for several hours and their vehicles were destroyed. They are also accused of mobilising thousands of pro-independence supporters to prevent police from stopping the October 1st independence referendum from going ahead. “What makes me sad is the accusation of violence, which never existed,” Sanchez said in December on Twitter. He was elected as a lawmaker in snap polls in Catalonia in December and has twice been proposed as a candidate to lead a new Catalan regional government, but a judge refused both times to allow him to leave jail to be sworn in. Seven other Catalan separatist leaders are in jail in Spain while they await trial for rebellion, along with the two leaders of the grassroots separatist groups. “I took part in all the protests and I never saw an ounce of violence except for that by police when they repressed the referendum,” said Juan Jose Cabrero, a 74-yar-old pensioner at the protest. Catalonia has been in political limbo since Spain’s conservative central government imposed direct rule on the region after it unilaterally declared independence in October. Fresh regional elections will be triggered if a new leader is not elected by May 22nd. In a letter sent from prison, former Catalan vice president Oriol Junqueras said that immediately forming a government was “a necessity” so that Catalonia could regain its political autonomy.